Notes: I feel like I’ve been slacking with my reviews lately. I’ve been doing them, it’s just the whole photographing, formatting and posting thing I’ve been bad at. I just started my last semester of college, so things have been a bit hectic. 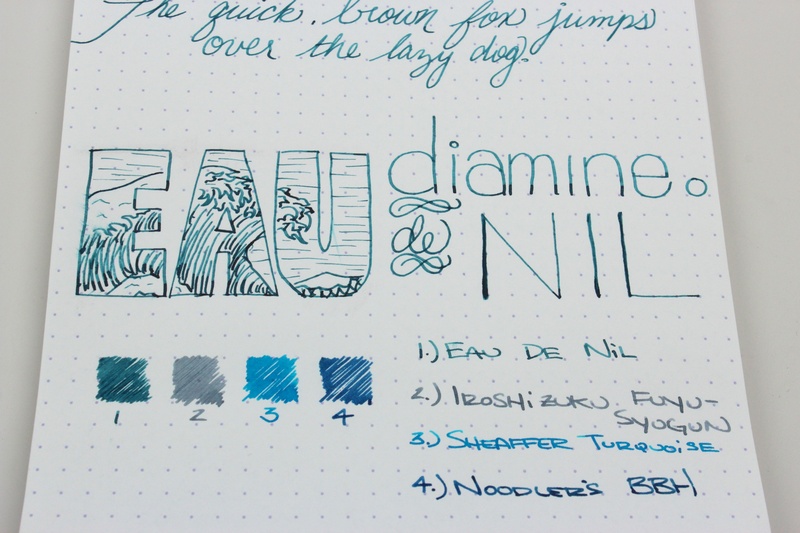 Anyway, here’s my review of Diamine’s Eau de Nil. I know most of my reviews tend to be positive, but 90% of the reviews I’ve done, I’ve bought the items in them, so from the start I’m hoping that I will like them. I’ve been wanting to try out Eau de Nil (means “Water of the Nile”) for a long time now, and I was ecstatic when it showed up in last month’s Ink Drop. I this ink has moved it’s way up the ranks into my top ten favorites. It is a great shade of blue/green and has really nice shading. I’ve been taking a lot of notes with it, and the color is easy on the eyes, yet unique. 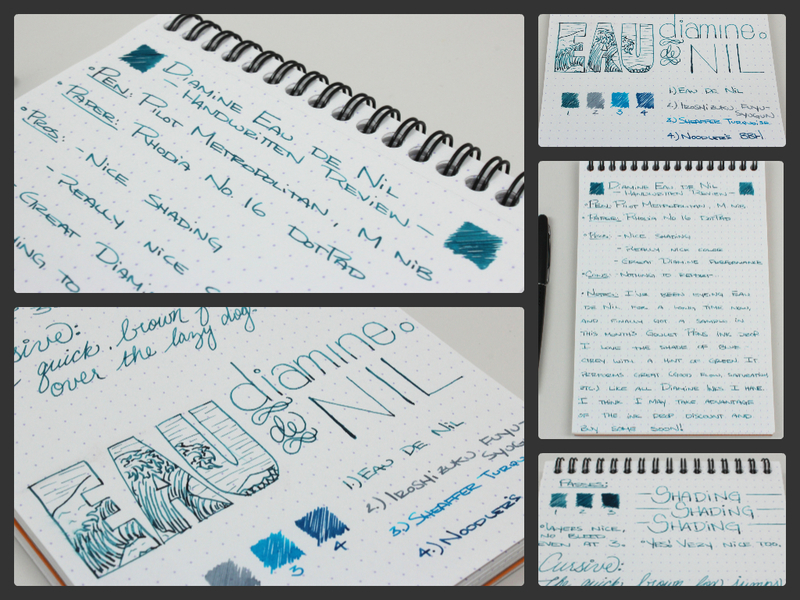 Diamine is one of my favorite brands of ink, and for good reason. 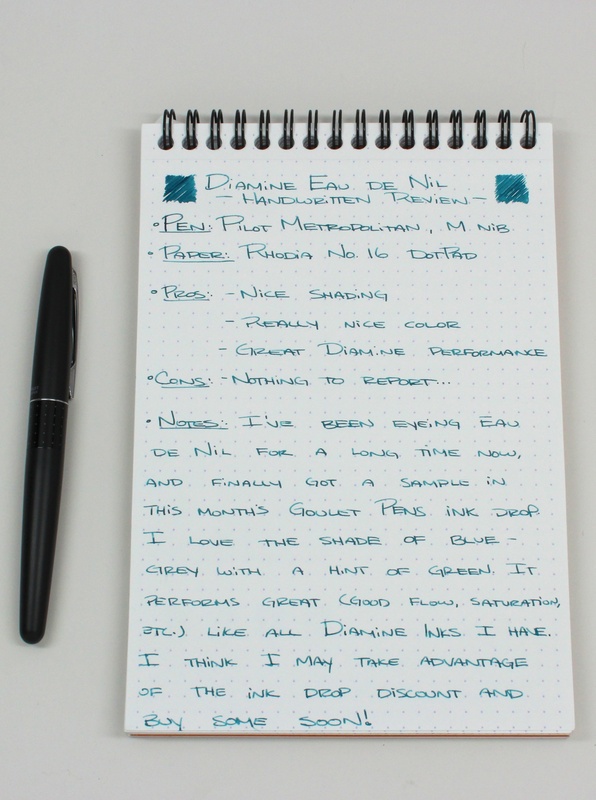 All the Diamine inks I’ve tried and reviewed perform wonderfully. I will surely be taking advantage of the Ink Drop discount and be picking up a bottle of this stuff. It’s great. 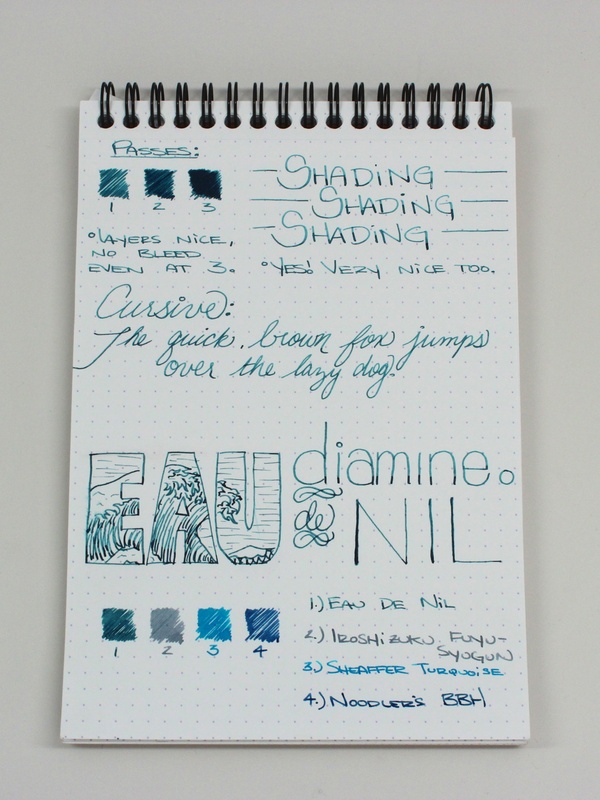 Eau de Nil has great shading, even in the finer Japanese Medium on the Pilot Metropolitan. It’s very smooth, and the flow is right in the middle where I like it. Do yourself a favor and check out the full size image for a close-up of the shading. The fun part. I know the wave is Japanese, and the name of the ink is French and the meaning is referring to a river in Egypt. I’m just going to classify this one as being multi-cultural. I especially liked the color palette of the comparison inks. Eau de Nil goes great with the Pilot Iroshizuku fuyu-syogun. If you put it in a fancier bottle and doubled the price, it could 100% pass for an Iroshizuku ink. I too love this ink. I have it loaded in a Sheaffer Flighter, medium point. I’ve put it on my purchase list. It’s definitely high up on my list, I was pleasantly surprised. I like it more than the Diamine Marine I had tried and loved a while back. I really like that “bento box” layout that you use at the top of the review. And yeah, I’m gonna need to try this ink too. Thank you! I’ve never thought of it as a bento box before, but now that you said it, that’s all I’m going to be able to think of, haha. Definitely give it a try, it’s great. Ed – your review was spot on. I also recently tried Eau de Nil after considering it for a while and came to many of the same conclusions. I absolutely love the shading; it shades in ANY nib. I currently have it in a Pilot Stargazer M point and a Pelikan M400 custom stub nib; shades outrageously in both. The color of this ink is satisfyingly complex; I call it smoky and subtle. For a slightly different look, it looks great on cream-colored paper. I am always on the lookout for my “perfect” shade of blue, and so far, this is it. I like that it has an equal share of blue and green; neither color overpowers the other, as so often happens with teal/aqua inks. Inks that are more green/more blue are fine, if that’s what you’re looking for. I’ve been searching for that balance between the two colors, with a hint of gray. And you are right about Diamine inks. They have so many colors with very subtle differences between them. If all you do is look at an ink color chart, you don’t get the full impact of those subtleties; they must be tested. 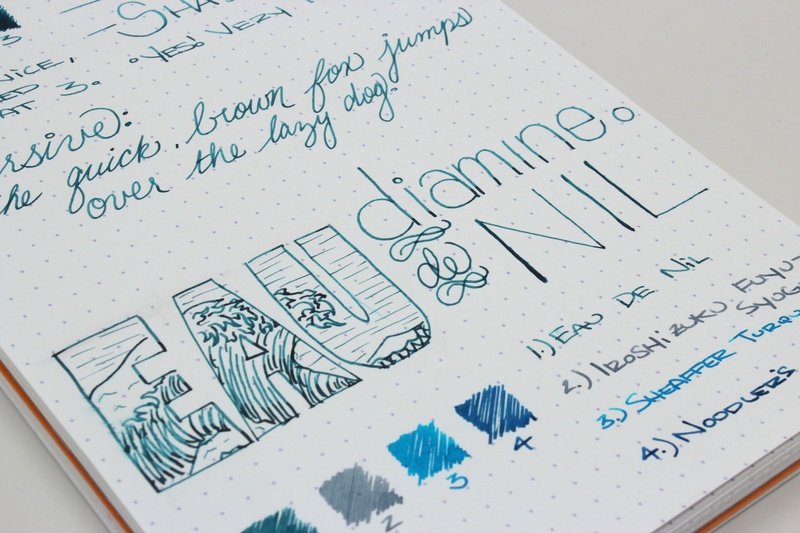 There are many more Diamine ink colors I want to test because of all the winners I’ve found in their line. You can’t beat them for reasonably priced, accessible, quality inks. Available in small bottles, too! Small bottles = more money for variety in my ink collection. — Sorry to run on so long; can you tell I really like this ink? Thanks for a great review! I just ordered the 30ml bottle of this ink. Judging from your photos, I think I’m going to like it a lot! I’m about to do the same, I hope you enjoy it! I can’t wait to get some of this in a broad nib. And thank you for all the reviews, great photos, etc. You have inspired me with your pretty handwriting. I’m so glad you’re enjoying the site! I apologize to your wallet, but it’ll be worth it. 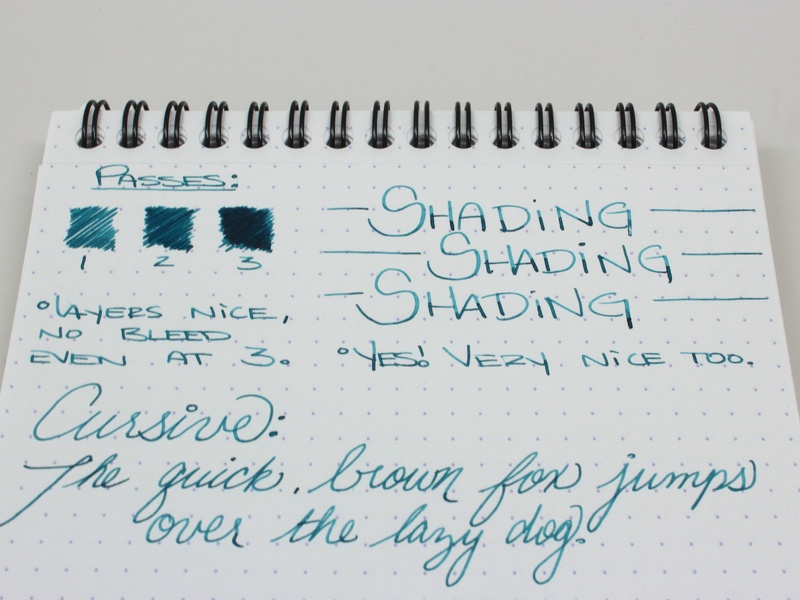 Diamine is definitely one of my favorite ink brands, they’re all so consistently good.